Put your notebooks away - it's time for a pop quiz. In each of the following pairs, one is an actual fraternal organization that exists (or existed) while the other is a fictional fraternity from a TV show. Can you pick out which is real and which is fictional? Time's up! Pencils down. How'd you do? Perhaps one of the best sources for learning more about (real) fraternal organizations whose roots lie in the 19th century is Albert C. Stevens' The Cyclopaedia of Fraternities: A Compilation of Existing Authentic Information . . . of More Than Six Hundred Secret Societies in the United States (New York : Hamilton Printing and Publishing Company, 1899) [Call number: 00 .S844 1899]. Since Stevens's book was published in 1899, there are obvious limitations to its use, but he did a great job in compiling the info available to him at the time, and it's a fascinating starting place for seeking more information about fraternities that you might not have heard of before. Oh, and those men in the photo pictured here? That's the first Supreme Council of the Mystic Order of Veiled Prophets of the Enchanted Realm in 1890. You may know this group by their more familiar name - The Grotto. The photo is from Sidney Smith's History of the Supreme Council of the Mystic Order Veiled Prophets of the Enchanted Realm, published in 1903 [Call number: 77 .S659 1903]. Below is a sampling of five titles from our collection, each one containing more information about the real organizations from the quiz above. Hildebrandt, Otto F. A Peep Into the Mystic Realm. Printed by Department of Printing Masonic Home & School, Fort Worth, Texas, 1946. Pienkos, Donald E. One hundred years young : a history of the Polish Falcons of America, 1887-1987. Boulder : East European Monographs ; New York : Distributed by Columbia University Press, 1987. Campbell, John H. History of the Friendly Sons of St. Patrick and of the Hibernian Society for the relief of emigrants from Ireland, March 17, 1771 - March 17, 1892. 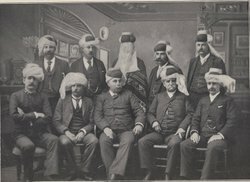 Philadelphia : The Hibernian Society, 1892. Winters, Rabbi Alton. Order of Girls of the Golden Court / endorsed by the Grand Link Order of the Golden Chain. Connecticut : the Grand Link Order of the Golden Chain , 1957. A Statement of the objects and purposes of the Improved Order of Heptasophs, a beneficial and fraternal organization ; for social purposes and to create a benefit fund / incorporated by the State of Maryland, August, 1878. Maryland : the Improved Order Heptasophs , 1878.